He continued creeping along, the blood lapping anew into his thoughts. With his acute sense of audition he perceived voices in song, a choir, a congregation of a church, no doubt. He turned towards the origin of the sound, and began to move closer. He passed as a shadow through a graveyard, some of the stones marking the final resting place of those whose blood he had taken. Of this he was scarcely aware. The church stood hulled in the thick tar of night. As he approached, it loomed ominously before him, surreal in its proportions. But he did not shy away. Where there is song, there is also blood. BLOOD! 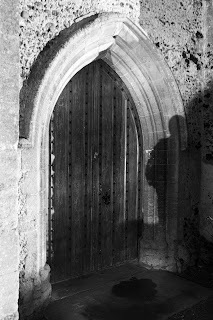 He stood before the massive door, pulling it open just a crack. He could not cross into the consecrated bounds of this sacramental location. But he waited, eyes turned downward, and listened. An organ toned the notes of a new melody, drawing a multitude of voices together into a sincere and unpresuming unison: "Silent night, holy night...." the peaceful words flowed to where he stood, and for one moment he forgot the blood. This photo appears by kind permission of Michael Spry. Please feel welcome to browse his flickr gallery (Mickal) and his Website (michaelspry.com). Merry Christmas, Happy Holidays and a Grand New Year to Everyone! I will post story #414 in the next days - still not satisfied with what I wrote - thanks to all who contributed! Contributions are welcome for this photo too, but I felt I should post first this time. You've all been so patient. Claus had a rainbow tucked away in his attic. Of course everyone wanted to touch it. "Keep the line moving!" 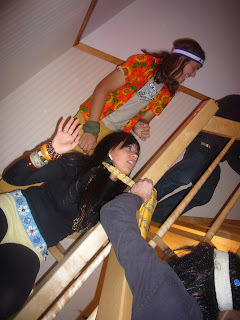 Claus called to his friends on the spiraling stairway. "No crowding! Everyone will get to touch the rainbow!" But they did crowd. And teased as the line ground along, starting and stopping like traffic at Friday rush hour. "Stop pulling my scarf!" Sally shouted at Todd. She had donned an ensemble of midnight blue, with a smattering of green and yellow accessories to catch the rainbow's eye. "Ha! Purple is the Bow's favorite color!" Todd kidded her, "Just like I have on." "I think he'll like me best," said Karin, pointing to her flaring orange blouse. Sounds from above silenced the conversation. All heads turned upwards to see the flashes. It was as if someone had whipped roman candles into the Northern Lights, but even that was insufficient to describe the illumination that echoed down to them. Mysterious ohhhhhs and ahhhhhs seeped from the realm beneath the roof and careened down the stairs to the excited ears that waited, tones they had never heard before. "How'd you ever catch it?" Maggie asked Claus who stood atop the landing, guiding the line of visitors to the final destination. "Left a window open, a dish on the table, sugar cubes dipped in paint," he confessed with a shrug, and winked, causing everyone to believe it wasn't true. At the stairway's end stood a ladder eight feet up into a gaping hole in the ceiling. All eyes watched the lucky person whose turn it now was to ascend. That was Tim in tie dyed jeans and psychedelic t-shirt, his eyes a yin yang of hazel-green. He was a walking rainbow himself. Everyone froze as Tim mounted the ladder. They allowed their consciousness to drift into his, to experience firsthand what would unfold. "Eyes are upon me. First rung. Second rung. Higher. Higher. Scurry through the opening into the rainbow's room. A swirling pool of fireworks floats before me. I dive into it..." The thoughts paused. "Ohhhhhhhhh. Ahhhhhhhhh" he said as the glut of colors dissolved him. Thanks to everyone who contributed stories! Well sir, softball's my game. I admire the shape of a graceful gal dancin' a ball through destiny, runnin', jumpin' and slidin' like a ballet lady doin' square dance. And them postures! Like poetry writin' itself! I been goin' to these games ever Saturday since I been a young'n - before you's born, I suppose. I could tell you stories. See that pitcher down there? Reminds me a Bruna. That was afore all these gals here been born. She was a legend. A marvel in form and skill. I reckon I saw ever one a her games. The stories I could tell you bout her! I seen her hit a ball out a the park with her bare fists. That's how tough she was. And fierce! Used to play baseball. Talk was she'd killed a man in Kansas. With a home run. Ball come down a mile away and beaned him into the Great Beyond. They made her leave the state and promise never to play baseball agin but she started right back up in the next state playin' softball! 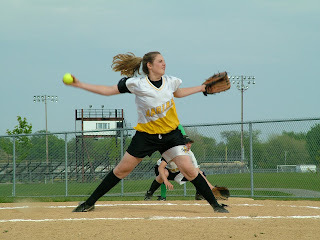 Ain't nobody could hit one a her pitches no matter what size ball she throwed. Now a gal got a reputation like that it gits talked around and Bruna's got talked clear outta the galaxy, all the way to Alpha Mango! Them critters out there loved softball. They'd watch her games via asteroid straight on into Mango. They couldn't play softball themselves, mind you. Ironic. Cause the entire planet was like one huge softball field. Red clay dust and sun shinin' gentle like a daylight moon. Well sir, they almost could a played it but their heads was too big to hold a softball cap. And was like to pop if'n a ball'd ever hit 'em. So that was out. They just watched Bruna. But you understand, watchin' games via asteroid ain't the same as bein' there. So these Mangonians, they decides they's gonna take a trip to Earth and right in the middle of a game, while no one is lookin', they's gonna girlnap Bruna, her team and the entire other team they's playing against. Then they's gonna whisk 'em off to Mango and shunt 'em around the planet playin' softball the rest a their lives - to Mangonian masters! That's a gawd awful thing to happen to a team a fine atheletes like these gals was, but they didn't know it was gonna happen. Not until them Mangonian hyenas come ploppin' down outta the heavens like pigs what couldn't fly. They was 18 a them, one to a gal. At first everone was stunned and silent like, the way they might figurin' out a firecracker gone off in church service. Then everone a them Mangonians lunged towards a gal and there was screamin' and a runnin' and mayhem worse'n dawgs in a cat kennel. Then I saw what I guess I admire most about atheletes. They can look at a situation they done never seen before, size it up, know what they wanna git out a it, and then do what it takes to make that happen. Bruna had the ball and she precisioned up the mightiest pitch I ever seen. I wished I could a seed it in slow motion. That ball left her hand like a atom bomb out a airplane and bing'd right off a Mangonian's head. That head popped like a soap bubble and gook streamed out like butter meltin' off a hotcake. Bruna's coach was a quick thinker too and he started hurdlin' buckets a softballs out onto the field. Bruna caught one and she pitched one after the other a them balls and didn't stop 'til them Mangonians was 18 headless autopsies. Well sir, after that the umpires come in and restored order and had 'em clean up the field and after the field was all virginned up again, set the gals back to playin'. But nothin' much else happened in that game, ceptin' that Bruna pitched another no-hitter. Thanks very much to Ctoner for donating this photo! - Cooper has started a fantastic new site called Should Be Famous. - Western Swing on 78 is a fantastic old-time site with lots of music to explore. - Last and least: I finally posted Story #408. Thank you everyone for being so patient with me while I try to get started again. 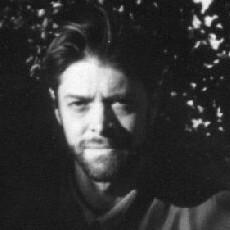 I've finally commented the stories for Indeterminacy #410, which was a photograph of my muse. And I reposted all the stories at the companion blog Indeterminacies, along with links to the contributors. They really deserve their own place somewhere. For those who don't know, Indeterminacies used to be the blog where I reposted visitor stories (when there were fewer of them, and i had more time). Feel free to browse the archives and enjoy the various perspectives arising out of a single source.